# bind-tools-9.1.1.0 change dig to not working with MS DNS out of the box. By default, (new) dig will send requests with a DNS COOKIE option present. You can disable this with dig +nocookie. In BIND 9.10.x the option to do this is "request-sit no;"
From BIND 9.11.0 onwards, it is "send-cookie no;"
and tell kde which image to use. 2015-11-22: I must finally say, "Good Bye" to Evolution. I have been using Evolution since 1999, when I bought it from Ximian. I loved it. It made me a first class citizen in a Microsoft World. It let me do so much, siimply, and not worry about viruses. requires systemd (an init system), which is ludicrous. If Free Software takes away my choice of init system, it is not Free. So, after 16 years, Good Bye Evolution! Sad to see you go. It will use the MIT license. so it's not a community project yet. "Join me, and I will complete your training." Systemd Really? Can't we do better than that? empire-building, which fall into 3 categories: pro, con, abstain. 1. fixes inadequacies of other init systems and programs systemd displaces. 2. supports new features (multiterm) not available elsewhere. 3. is a more secure improvement architecturally. 4. must be good because major distributions adopted it(RedHat, SuSE, Debian). 5. herald a new erra of innovation for the Linux operating system. to another system (though they did not fix existing systems). - LGPL v2.1 may have problems but it is a legitimate free software license by the FSF. - Integrating systemd into Debian may be a technical mistake (or not) but it is not immoral or against Debian's own ethics/rules for conduct. --- but no choice is not nice. handling, and this increases the opportunity of a kernel panic. 3. Has a creeping Scope, continuing to broaden beyond init, into application level dependencies. 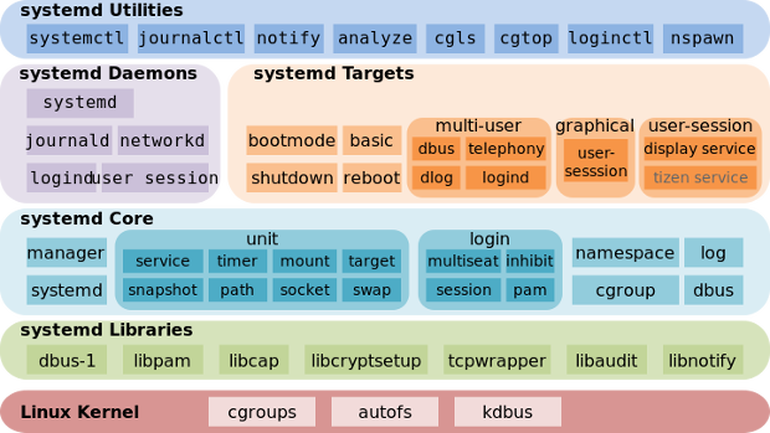 the systemd init system to build and run. This waves a big red flag in my mind. 4. Needlessly uses binary logs, displacing choice in log daemons. Does anyone else find it handy to parser logs? Keep it simple stupid! How are you going to make custom stuff for linux with binaries you can't read? even if they are true, it doesn't change the fact that a better solution must be found. the 5000 pound gorilla Linux user space is upon us. 1. it replaces udev, dhcp-clients, login, syslog and the list grows. 2. its monolithic, API-lock-in-oriented, make exit migration unlikely. 3. pulls requirements one does not need on all systems. 4. makes it unnecessarily all-or-none. 6. scope is driven by Poettering's will. a one-way migration trap in FOSS, embrased by even Debian. 1. it doesn't effect them. This group is shrinking as the scope of systemd expands, and ubiquity materializes. I hope they start to care before all alternatives become unmaintained and antiquated. archiecture, like MicroSoft and Apple learned many times. 2. there is no alternative or choice. another distro, and itry to design a better architecure your self. 3. Lennart Pottering is just a misunderstood community builder, open to pull requests. I have tried to send him email, but his inbox is /dev/null, until systemd creates Trashcan. 1. init (PID1) only executes an rc program, keep it atomic, simple, isolated, durable. 2. init must be transparent to applications. 3. init must have a well defined interface that is small, so it can be swapped out for another. 2. rc launches process supervision program running daemons. Candidates: include DJB's daemontools, runit, Supervisor, GNU dmd. Maybe Linus will save us. 1. Systemd is bad for server security, has too may cross dependencies, requires reboot on upgrade. 2. Diversity is good in any ecosystem (lesson from nature), and systemd hinders this, so it is bad. 3. The migration to systemd does not offer a path away from systemd, so it is bad. 4. Don't trust a leader that is willing to fragment community, and leaves avahi.org down for a month. 5. While Gentoo offers a choice, I will stick with it, otherwise I'll be Without Choice in Linux. 6. Debian violates it's mission charter by adopting systemd as the default init, as it removes many freedoms. 8. In a well desiged system, a gui should be isolated, and not dicate the init system. 9. I am disappointed by the failings of leadership in unix philosophy and comminity building, by Gnome, Debian, and the rest. Configure nautilus to let you type path to a file (default makes you click icons). Clicking icons can be far slower and tedious than typing a path. Gnome 3.8 requires systemd, which replaces openrc and udev. I mainly run KDE, but I like a few gnome apps, like Evolution. I have used Evolution since 2000, when Ximian created it. But I will switch to something else if my Mail User Agent is going to dictate my init system. I like this persons review of gnome 3. In my opition, Gnome better evolve past an all-or-nothing model. They may get my MUA, or maybe even my desktop, but is a GUI to claim my system init? No! Take a hike. cross platform just isn't important enough to game manufacturers, so they choose DirectX over opengl. That is fine, they lost a customer, and I have more productive things to do anyway. I joined their beta list, to find they also are only Windows. Ar! 64bit Gentoo, wine-1.5.16-r1, and winetricks-916. After all that, you return to the main wintricks page, and choose cancle to close. Next I have to deal with my Nvidia Optimus hybrid graphics card. Install bumblebee, which gives you optirun (enables the nvidia part). nedit doesn't do utf-8, but sports some great features. Line Numbers Statistics Line, Goto Line (ctrl-l), or select compiler error and Search ... Goto Selected. Opening Included Files, highlight include file and select File ... Open Selected. Finding Declarations (ctags), NEdit to go directly to the declaration of a highlighted function or data structure name with a single command. Interface to Programming Tools via the client server interface. Tab emulation, replacing with 4 spaces is handy. and the linking is what creates a derivitive work. and it is derivitive work that can't be redistributed without source. which must be distributed with source and tools to rebuild the binary. For Dynamic linking, at compile time the linker only records what library routines is needed and the index names or numbers of the routines in the library. without themselves becoming subject to the full terms of the GPL as a result. This whole thing seems very confusing to me. CSUEB LUG - 3rd Saturday each month. 2-4pm. My RSS reader has exposed a High Frequency and Large Volume of news about Ubuntu each day. I am not Super Impressed by Ubuntu, so why is there so much news? Does Ubuntu has a professional PR department generating news? I think so. Is that bad? I can be. Will it become a pawn in the OSWars in the end? Ubuntu is offspirning to the Most Noble Debian, but how far from the (source)tree does it fall? I'm disappointed in Ubuntu for not giving their developers the job of helping Debian (thier base) reach it's next stable release (etch). What deserves more press, as it is awsome, is Gentoo. As you can see here, a frequent Ubuntu promoter bashes Debian for not releasing etch on time. I had to log out and log in again. Now it works. but this hack means it's kinda broken. Thankyou Adobe! Finally, Accrobat Reader for Linux support a wheel mouse! Who reads more in pdf format than geeks? What are they thinking? Thank you! Thankyou! Thank you! Adobe rocks. Now how about PhotoShop? See http://stilen.com/linux101.txt for apt and dpkg usage notes. See http://stilen.com/notes/debian101.txt for little tweeks and hurdles to make my systems work. Guess they just don't get it yet. Turboprint does have one though, but it costs as much as the printer. I first heard of this when I upgraded SuSE from 9.1 to 9.2. Suddenly true type fonts in Kopete stopped working. When porting mplayer-plugin rpm from Fadora Core to SuSE 9.2, XFree86-devel could not be found. That's because XFree86 is not part of the SuSE 9.2 distribution., but X.org is. Debian and Gentoo are also switching to X.org. - security and bug fixes that I found in Xorg CVS but not in XFree86 CVS. - improvements for fontconfig, Xft and other code in Xorg but not in XFree86. - Some of our fixes in NetBSD's xsrc came from Xorg because XFree86 didn't have yet. - the Xorg community is friendly and appear to be open to suggestions. - Xorg tries to have frequent, but not to frequent, releases. More cool rpm's for SuSE, at least someone has the right idea. Come on SuSE! Just add the package player to your distro or donate to EFF. By buying a dvd and dvd drive is it no fair use to be able to play it with a free player? I finally get why people say Debian is the right way to go. number, and make the upgrade a scary forest of errors, pit-falls, and bobbitrap. They plugged a ZIF socket into the normal bios socket, and then plugged normal bios chip into ZIF. The ZIF socket makes it easy to remove the chip while system is on. Buy a Disk-on-Chip (holds about 8MB). 1. Get LiuxBIOS source code. 2. Get the correct Linux kernel source, patch, and build. Must change a line in source to get MTD working. 3. Configure and build the LinuxBIOS boot code for your motherboard. 4. Get the Memory Technology Devices (TD) utilities and build the 'erase' utility. 5. Remove the BIOS chip from its socke ( while power is on ! ) and put a Disk-on-Chip (DoC) in its place. 6. Burn the LinuxBIOS image containing the boot code and the kernel into the Disk-on-Chip. 7. Hit reset to start the new LinuxBIOS system. SuSE and RedHat both have very easy update utls (yast and up2date -u). I just need to get more flavers under my belt. See the notes section for good howto's. 02 2001: So whats all this certification stuff I'm noticing? but what are you gon'a do? I personally have a life too. Good Q/A page for Linux.